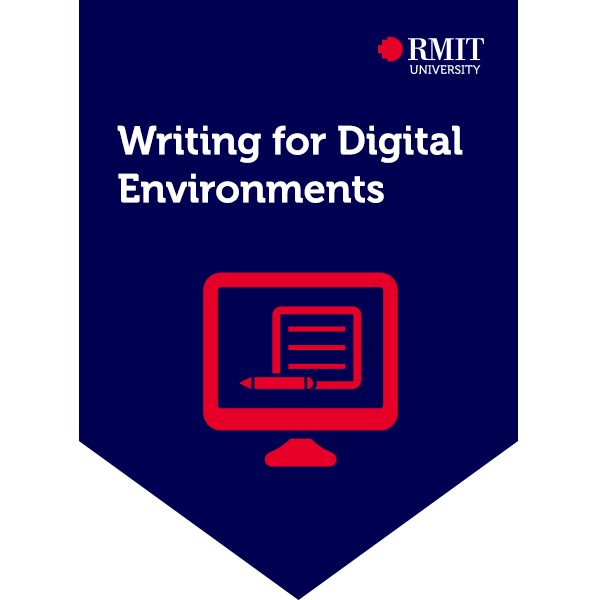 The Writing for Digital Environments credential sits within the Digital Literacy stack. This stack is designed as a tool to support lifelong learning; to prepare you for living, learning and working in a digital society. Communicating and marketing online is a skill all to itself. People spend their time online flicking from one item to the next and if you want to grab their attention, you've got mere seconds to do it. That's why, when it comes to writing online content, you need to know how to craft simple, compelling messages; ones that will cut through and make people take notice. Come learn how to write crisp, clean content, specially crafted for online platforms, from bite-sized Facebook and Instagram posts to longer-form blog-style content. You'll also get the fundamentals on writing for search engine optimisation, to help maximise the chances that people will actually see your content. By completing writing tasks and a communication brief, the earner of this credential showed that they know how to write simple, concise content designed for online platforms, and an demonstrated and understanding of how to tweak their content to maximise search engine optimisation.